More than two years removed from a midnight deal to avert what would have been the second strike in four years, members of the Chicago Teachers Union are once again heading back to the bargaining table. 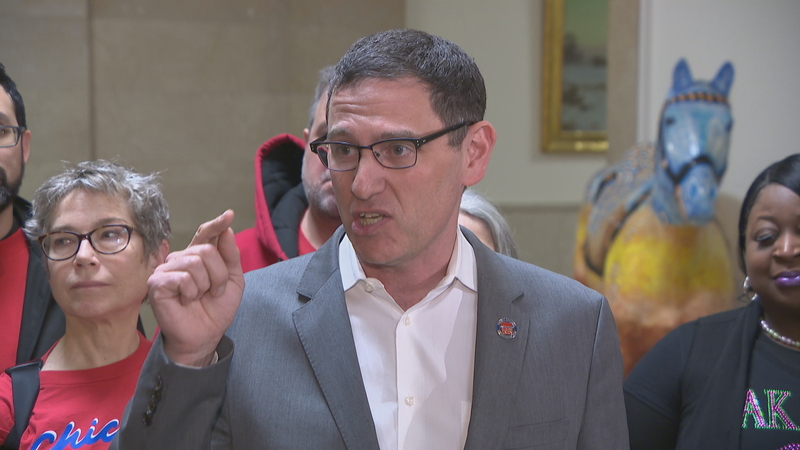 CTU President Jesse Sharkey formally submitted his union’s list of contract demands Tuesday to Mayor Rahm Emanuel’s office, marking the official start of what's expected to be a months-long bargaining process with the city and Chicago Public Schools leaders. Pay and benefit increases are atop the union’s list of demands, as Sharkey said CPS’ pay rate has fallen below other districts. But the union is also pushing for more investments inside the classroom, calling for reduced class sizes and new hires to help fill critical staffing shortages. “We will be told these demands are unrealistic, the price tag is too high, it’d be nice but it’s just too expensive. Bullcrap,” Sharkey told media Tuesday. “If we can afford a billion dollars for [the] Riverwalk, a billion dollars for Lincoln Yards, then we can afford a billion dollars to invest in the children of the city of Chicago for our future," he said. Union leaders have long called for additional counselors, nurses and librarians in their schools and are now demanding improved staffing ratios. They also want the district to put an end to student-based budgeting and add 100 sustainable community schools on the South and West sides the city. Other contact demands include better sanctuary protections for immigrant students, an increase in African-American and Latino staff, wraparound services for special education students and affordable housing options for employees and families. CTU Vice President Stacy Davis Gates wouldn’t give an exact figure Tuesday when asked what these changes could cost. She instead pointed to other billion-dollar ventures Emanuel’s office has already undertaken and said those funds could be put to better use inside Chicago’s schools. Union leaders are hopeful new Gov. J.B. Pritzker will provide new revenue streams to help fund the school district. Davis Gates said the school district could benefit from tax dollars levied on legalized marijuana or sports gambling, or from the profits of a casino if one were built within city limits. If their demands are not met, union leaders says they are positioned to call a strike as soon as the start of next school year. CTU members previously walked off the job in 2012, which marked their first strike in more than two decades. And contentious negotiations nearly led to another strike in late 2016. But leadership on both sides has since turned over. Former CPS CEO Forrest Claypool, who led the district during the 2016 negotiations, resigned the following year after he was accused of lying to cover up an ethics scandal involving his general counsel. He was replaced by chief education officer Janice Jackson. CTU president Karen Lewis, who had led the union since 2010, retired last year to focus on her health in the midst of a years-long battle with brain cancer. She was replaced by Sharkey, who himself will have to deal with a new mayor in finalizing the new contract. The union’s current contract is set to expire at the end of June. But Emanuel will be out office by then after voters choose a new mayor in February's municipal elections. Emanuel opted not to run for a third term. So with new leadership on the way, why did CTU leaders turn in these demands now? Sharkey says there is still work to be done before their current deal ends.